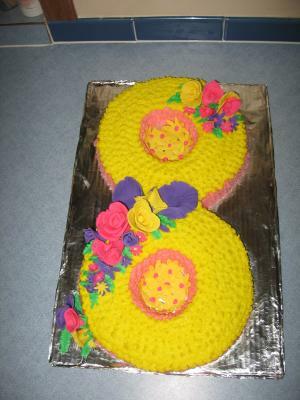 My friend wanted a number 8 cake for her 8th wedding anniversary. So I cooked two 8" round cakes and took a large glass and cut out the centers. Then I piped stars all over the cake. The flowers are fondant. The small flowers were cut out with a flower cutter and the roses I molded by hand.